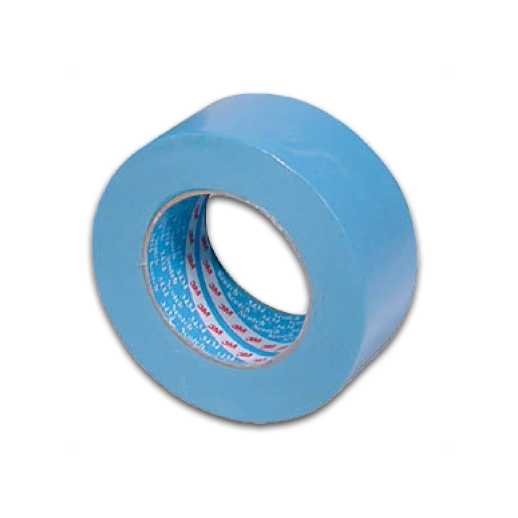 3M™ Scotch® Water Resistant Blue Masking Tape roll. Provides excellent masking in painting operations. The blue Scotch® High Performance Masking Tape 3M™ 3434 is a water resistant masking tape in light blue smooth creped paper ideal in all the automotive and auto repair painting masking operations. The support has an high resistance to solvents and water which ensures excellent adhesion if product gets wet and allows to obtain a good masking even in bends or on difficult surfaces, providing great protection from the infiltration of paints, resulting perfect for masking a car prior to spraying with either solvent based or water-based paints, with outstanding painting results. The crosslinked rubber-resin adhesive system provides excellent adhesion, excellent performance, easy installation and removal (easy identification for the light blue, does not release adhesive substance) and suits both modern 2-pack and water-based paint products. Furthermore, the blue high performance masking tape 3M™ 3434 resists to 110 °C temperatures for 1 hour and can be used in all applications in automotive.